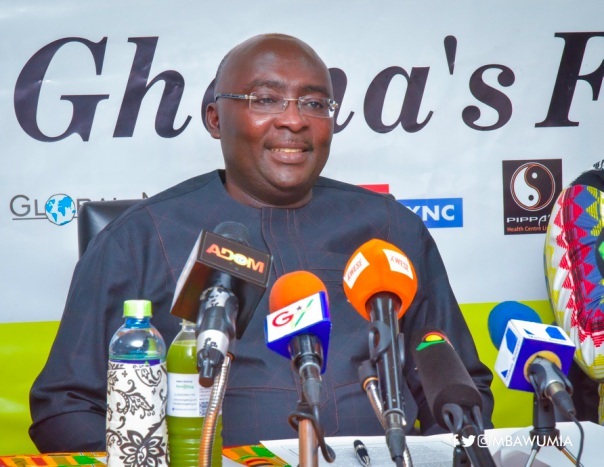 Vice President Dr. Bawumia has launched the 2019 edition of the ‘GNPC Ghana’s Fastest Human’ Athletics programme with a call on all stakeholders to put national interest above personal desires in order to help the nation recapture its lost athletic glory. Ghana was the African beacon for athletics in the 1950s through to the early 1990s, winning several international medals, but has struggled to make an impression over the past few decades due to a number of factors, including infighting at the Ghana Olympic Committee and the Ghana Athletics Association (GAA). Speaking at the launch of the Fastest Human Athletics programme, which is in the 6th year of its projected 7 year lifespan, Vice President Bawumia recalled Ghana’s glorious athletic past and urged all stakeholders to put aside their differences and work together to achieve success. “In this era where at international games, victors mount rostrums; National anthems are played; athletes compete in their national colors and national medal tables are prepared to rank countries, Ghana cannot continue to participate in International Games for the sake of participation. Ghana’s presence must be felt at international games to show our solidarity to the growth and development of global sports. “Ghana’s presence at international games can be felt only if we put in place a pragmatic Talent Development Pathway Policy and Programmes that are consistent with global best practices in talent identification and development. This should be operationalized by a dedicated leadership team that is working coherently to achieve a common goal; a goal that brings glory and honor to the country. “The team that we would depend on would be the Ghana Athletics Association, and I enjoin all in the association to put the national interest above personal interest. That is the only way we are going to achieve our goal, so work together as a team and put Ghana first”, Vice President Bawumia advised. On its part, Government is putting in place a number of interventions, including the construction of Centres of Excellence across the country and the promotion of inter-schools athletic competitions, the Vice President indicated. Vice President Bawumia expressed government’s appreciation for the continued support provided by the Ghana National Petroleum Corporation (GNPC), headline sponsors of the programme, and others such as Indomie, and urged corporate Ghana to support the GAA in its quest to find the next world champion. Shedding more light on the 10 Centres of Excellence currently under construction across the country, the Minister for Youth and Sports, Hon Isaac Asiamah, said when completed, they would each have an 8-lane running track and facilities for more than 15 sporting disciplines. Hon Asiamah also outlined a number of maintenance programmes for existing facilities such as the Accra and Cape Coast Sports stadia, with a view to ensuring they enjoy their projected lifespans. Ghana’s Fastest Human Athletics programme is an annual sprint competition, running from March to September, to unearth talented sprinters to represent the country at the Olympic Games and other athletic events. According to the organizers and promoters of the programme, over 50 athletic talents have received scholarships to school and train abroad, while others continue to receive training locally to sharpen their talents and make them world champions. Several previous national athletics greats, including Rex Brobbey, Mike Ahey, and Ohene Karikari were at the launch.